When: Tue., June 4, 5:30-7:30 p.m.
Queer Coffee House Presents: LGBTQ+ Focus Group! 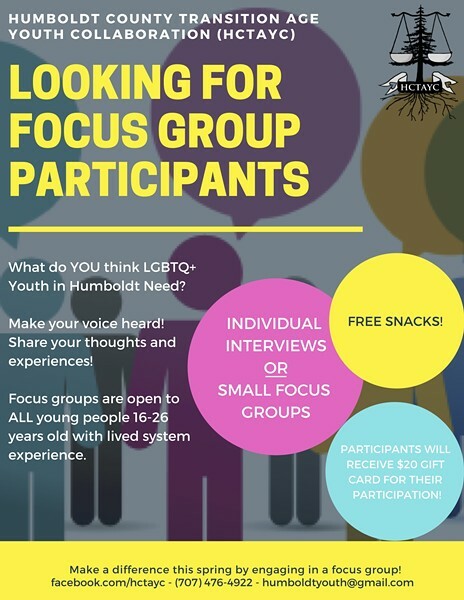 The Humboldt County Transition Age Youth Collaboration (HCTAYC) will be here to collect information from young people in the community to develop policy recommendations that will change the outcomes for LGBTQ+ transition age youth in Humboldt County. With the information gathered, we will develop better systems and services for our youth, but we NEED YOUR INPUT to make our policy recommendations as useful as possible! Participants must be 16 years old and will receive a 20$ GIFT CARD for their participation!! !